Would gladly share a peony with you. Glad to see you’re getting some lovely flowers in bloom now too. Glad you like the display Annette. They truly are wonderful sisters and we’re fortunate to have one other (also wonderful) sister. Flowers of pure love…..wow to grow these in their garden. And I love the full display with the euphorbia! Thanks Donna. I’ve tried growing amaryllis in my garden but they rarely bloom and certainly not so abundantly as these. Stunning is the only word to describe your vase today; lucky you having such generous sisters. I think I prefer the Hippeastrum without the peony although that definitely deserves a place in the display. Do I recognise the large clear vase? The two flanking vases make the display for me. Hoped you’d recognize this special vase. Enjoyed using it for the amaryllis. It was just perfect for their tall thick stems. The “IAVOM” meme has me fussing with my floral arrangements too but your fussing is always more productive. In my opinion, any arrangement embellished with a peony is better for the association but then I adore peonies. 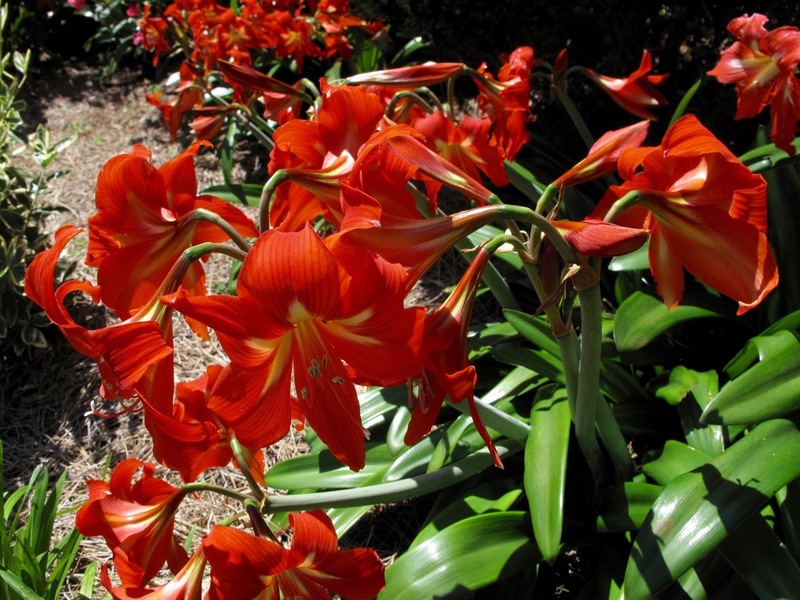 Your sisters’ Hippeastrum bed is impressive – I can only hope that my bulbs will naturalize as well. Oh, Kris! It’s true I do fuss (and take hundreds of photos). Your arrangements always show great thought and design. I look forward to them each week. 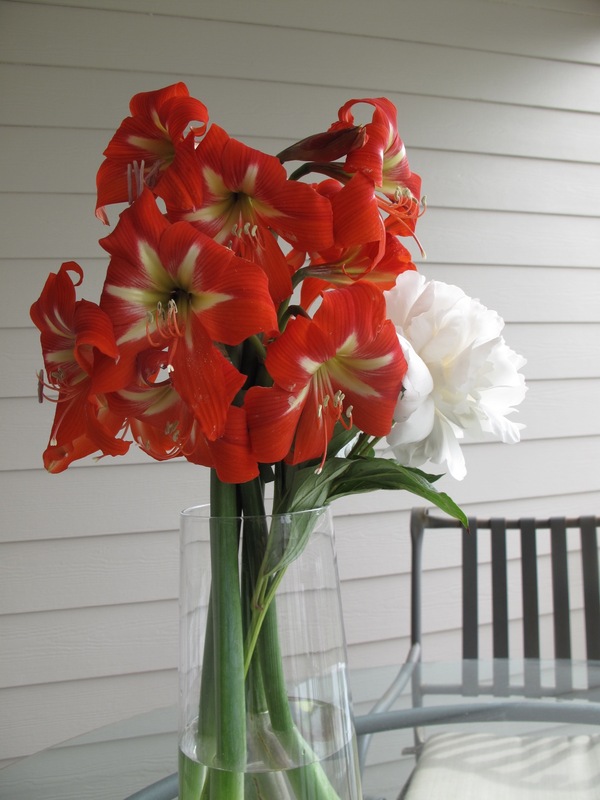 I would imagine Hippeastrum would do great in your location–not sure about water requirement for them but these pictured had a lot of room, lots of rain this spring and extra light since the shrubs were removed. I can’t wrap my head around growing such gorgeous Amaryllises outdoors! I have that same one, it is fabulous. 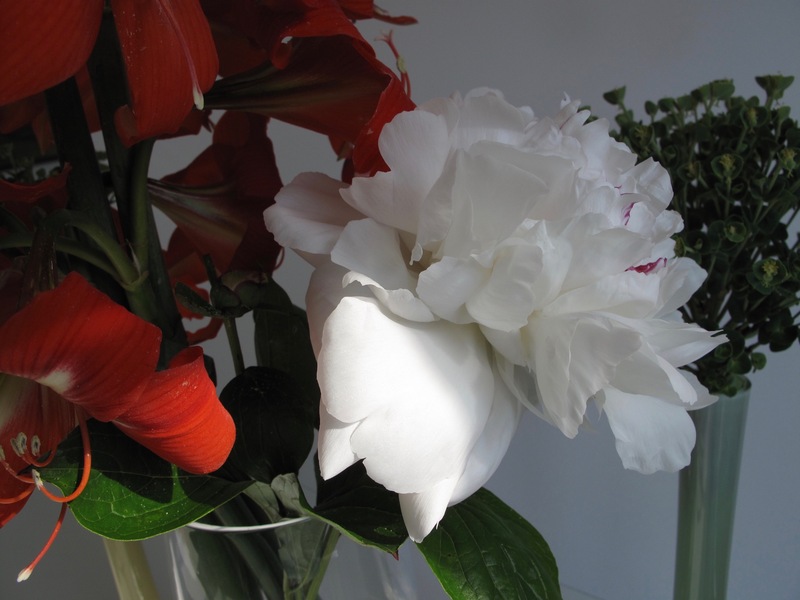 They look so gorgeous clustered in the vase, and I like the poofy white peony, I have a similar pink one still in bud. I love the Euphorbia flowers too, Susie. Hannah, I could hardly believe my eyes either when I saw my sisters’ Amaryllis–lovely but incredible. That euphorbia has been wonderful this year. Glad you have peonies too to enjoy. Nice, fresh, unexpected combination of flowers and vases! 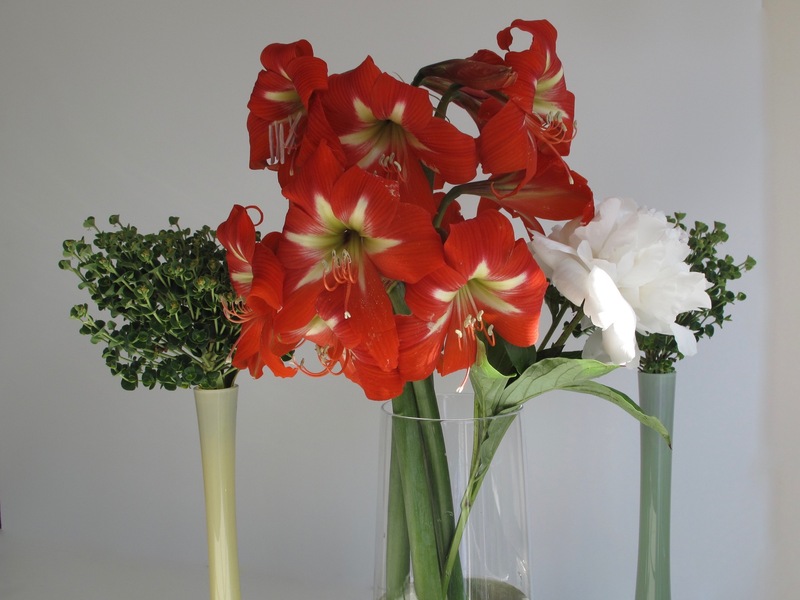 Amaryllis was the last thing I expected to be able to arrange in this week’s vase. Quite a windfall. I’m so envious of your sisters being able to have such a stunning display next to their walkway. 🙂 And lucky you to benefit from their generosity and lucky us that we get to share in that joy! Like you Eliza, I’m envious of their Amaryllis too. It’s an amazing display. Happy I could share them with you today. How kind of your sisters to share their bounty with you. I wish that we could grow amaryllis outdoors. Your white peony is quite beautiful and has done well to come through the rain unharmed. The amaryllis are quite a nice and unexpected gift. I’ve enjoyed them so much. I fretted over the peonies as we had serious rains for about 10 days as soon as the peonies started opening. Fortunately, some held up ok.
What incredible Amaryllis! They are native to Brazil, I believe, so your sisters are lucky to be able to grow them outside. They are indoors only for us, and it’s an inspiration to see what they’re capable of in an environment closer to their native one. It is amazing to see the amaryllis looking so lush. I knew they would grow here but have never witnessed such large ones. 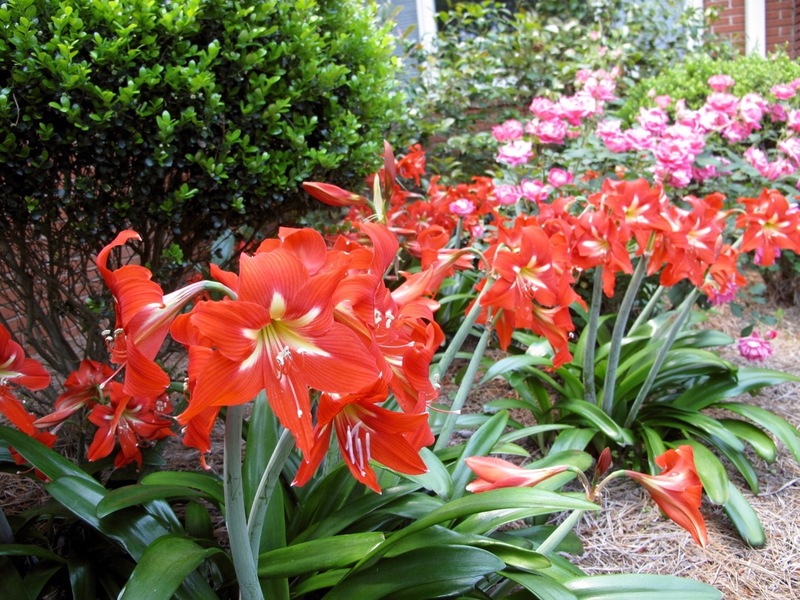 Is Fayetteville is close by, growing Amaryllis outside is so exotic, could you do that too Susie. 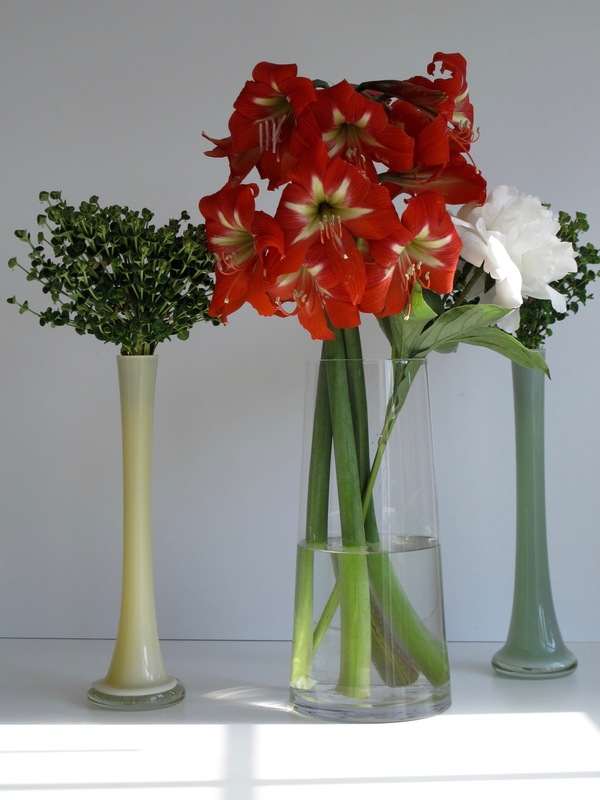 Beautiful vases and photographs, its really hard to do both well, especially with a tricky tall flower. Yes, Fayetteville is about 65 miles away south. I have successfully grown amaryllis off and on, but they disappear after a while. I don’t think I’ve given them enough space. Amy garden club meeting a woman presented a brief talk on growing them here, but she uses containers and puts them in a protected spot by the door. You’re right about the height of the flowers–made it hard to get the flowers and container without getting lots of other distractions. Thank you Beth. Yes, I am lucky to have my sisters (three total in fact). 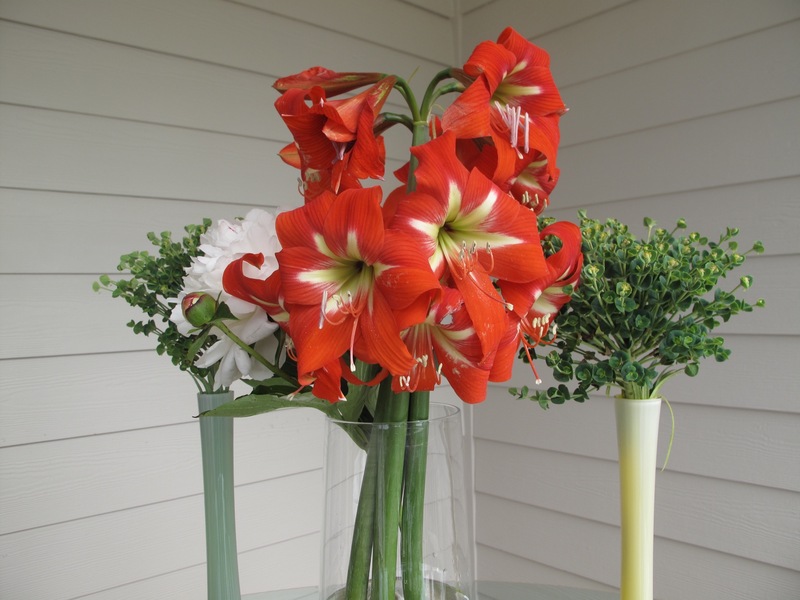 It was wonderful to get to experiment with the Amaryllis–the cost of purchasing would have been prohibitive. 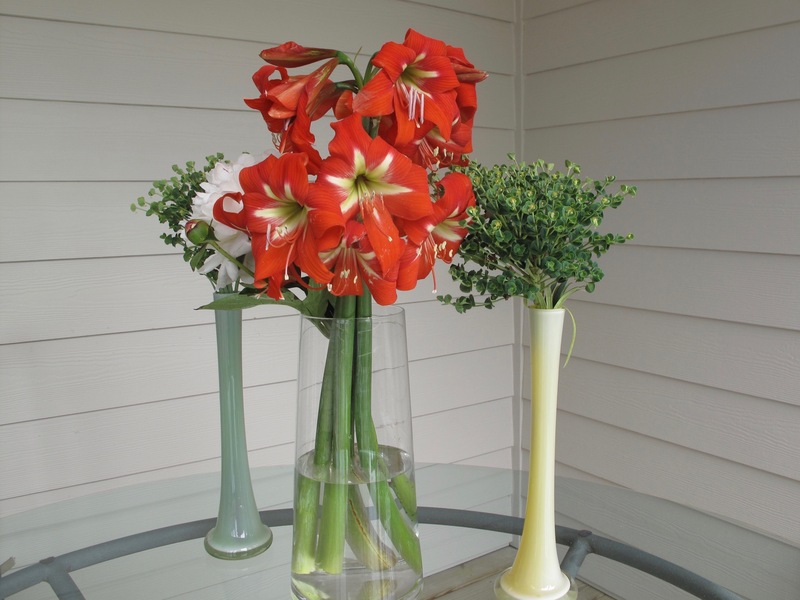 Those amaryllis are just stunning – both in your vase and in your sisters’ garden. Thanks Cathy. Makes me want to plant some here in my own garden again. How amazing to have these gorgeous hippeastrums growing in the garden. What a lovely gift. You have displayed them beautifuuly Susie. They look so elegant. I like the peony in there. Thanks, another vote for the peony! I feel inspired to try to grow hippeastrums again in my garden. I have one of two but they’ve become crowded out by more aggressive neighbors. The hippeastrum was quite a treat. One of my sisters actually gave me the tall, pastel vases years ago as a set. There is also a blue one in the set. A pink one broke in shipment. How great to be able to grow Hippeastrum in the outdoor garden. I’ve seen them a few times around town and even have tried them, but never have I seen such grand plants. The bulbs must have grown huge. Stunning Amaryllises and I like peony too. Thanks, happily they’re holding up well indoors and I’m really enjoying them. 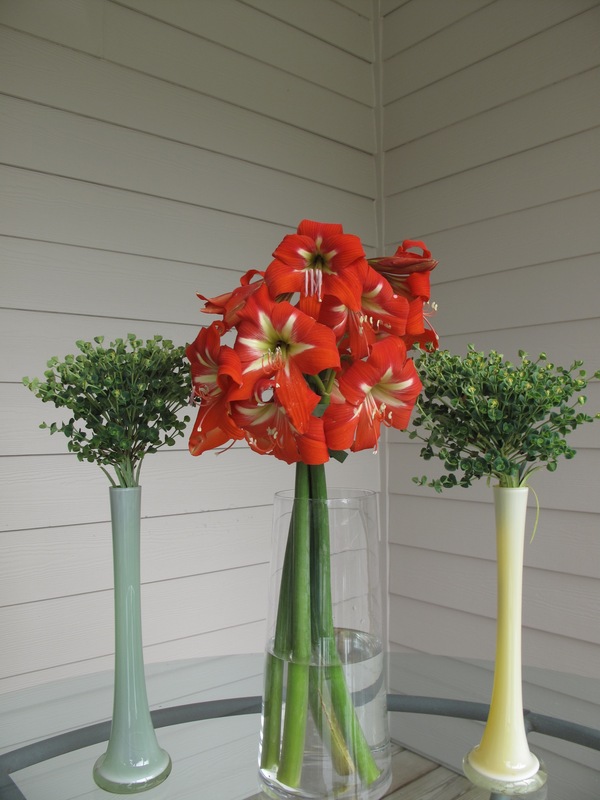 I love the addition of the bud vases with Euphorbia. I think you’re right about the peony, but sometimes sentiment wins out over pure design considerations. Interesting idea to bind the stems near the top. I’ll have to remember that one. Ah, another vote for Euphorbia! I think I like it also. Your sisters’ amaryllis are beautiful! They looking amazing en masse like that, and make a wonderful bouquet. The amaryllis in their garden were such a sight to behold. Felt lucky to get to bring some home. They are gorgeous! How wonderful to have them growing like that in the garden. I love the arrangements with the Euphorbia as an addition. I think I prefer the one without the peony, but seeing it in the vase with Hippeastrum is so very exotic and for me quite strange as the Hippeastrum are only grown indoors in winter here. Hi Cathy! I’ve had limited success growing Hippeastrum in my garden–rather short-lived, but the ones at my sisters’ house were planted by previous owners and so have been there for many years.